Need the PERFECT holiday gift? How about a gift that is simple, inexpensive, and local; a gift that literally keeps on giving? Give a library card! Know someone that doesn't have a library card, a child perhaps? Slip a library card form into their stocking or into a christmas card and explain that you are giving them thousands of books, movies, music and oh, so much more for Christmas. Give a "Friends of the Library" Membership. A great way to support libraries and often the membership is inexpensive --give a lifetime membership, very generous! Shop at library gift shops. Our local library has an amazing gift shop with lovely bookish gifts, cards and treasures. According to Carolyn Moehle, Manager of the TADL gift shop, "we have tons of stocking stuffers!" Contact the library for gift shop hours. Shop online via New York Public Library's extensive gift shop. Call your local library and see if they have a gift shop! Giving someone an eReader? Check to see if their local library has OverDrive. OverDrive is an amazing online resource that many libraries use to give access to ebooks and audio books to patrons. Click here to see if your local library uses OverDrive. Then give the eReader with literally thousands of books, wow! Giving books for Christmas? Stop by your library and get information on how to donate books. 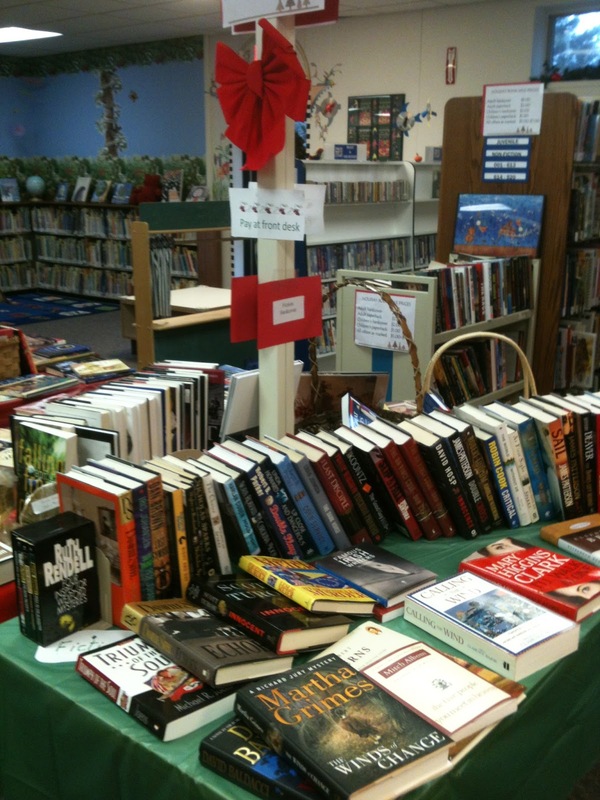 Then in the gift card suggest that when the giftee finishes the book they donate it to the library! Donate books to a library in the name of a friend. Be sure to call you library and ask what books they need. Then put a bookplate with "Donated by: your friend's name", take a photo of the book plate and slip it into a card with an explanation! We always love when we come across books at the library that were given in honor. Shop Library Book Sales. 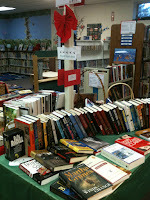 Many libraries have on going book sales with all sorts of wonderful options. Contact your library to see what they have available. Have a friend that is notorious for racking up library fines? Stop by their branch and deposit a bit of money into their account. Due to privacy issues the library can't tell you how much they owe --but they can credit an account! Take a photo with the librarian as you pay the fines (with big smiles) and slip it into a gift card! Give a library date. Invite the giftee on a library adventure. Often there are music and special events at the library --spend the day at the library with your friend. Remember the best way to give the library is to USE IT!! Clear out your bookshelves and donate them to your local branch. Give your librarians a present! We like to give a big basket of oranges and chocolate, lots of chocolate... lots and lots of chocolate. The simplest gift: Use your library. That is the best way to show you care. I a posting anonymously so that this post seems unbiased, hee hee! Many libraries have can food drives this time of year. Take in non-perishables to have your friend's fines wiped clean! Boy do I wish I had read this before I bought a gift for a certain someone who LOVES the library but was banned years ago for fines racked up in high school. Gonna keep that in mind! Thanks!